Big Sur is a unique location on planet earth that specifically has no boundaries, however generally defined and a locally accepted description of Big Sur would be 90 miles of coastline between the Carmel River and the San Carpoforo Creek, and extending approximately 20 miles inland to the eastern foothills of the Santa Lucias. The northern tip of Big Sur is approximately 120 miles south of San Francisco, and the southern tip is about 245 miles northwest of Los Angeles. The Zip code for Big Sur is 93920 and the telephone area code is 831. According to the most recent USA Census data there are approximately 1000 people, 884 household, and 666 housing units. Big Sur could be described as the collide of nature between heaven and earth; it is hopeless to eloquently put into words the magnificent beauty to be viewed in this special part of the world. The scenery cannot be done justice by film or secondhand account. An eclectic populace and cosmic vibe flows through the area and permeates Big Sur hotels, shops and restaurants. A table with a view isn’t hard to come by in Big Sur. Neither is a sense of well-being. Cliffs, rocks, redwoods and effervescent surf create an epic backdrop for a peaceful lifestyle of living, recreation, romance and relaxed exploration. It is difficult to generalize about the weather in Big Sur because the jagged topography causes many separate microclimates. This is one of the few places on Earth where redwoods grow within sight of cacti. 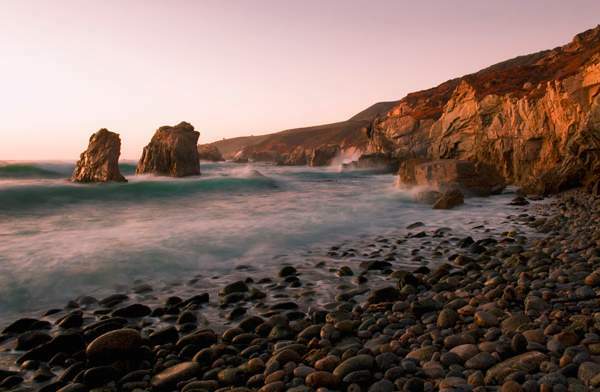 Still, Big Sur typically enjoys a mild climate year-round, with a sunny, dry summer and fall, and a cool, wet winter. Coastal temperatures vary little during the year, ranging from the 50s at night to the 70s by day (Fahrenheit) from June through October, and in the 40s to 60s from November through May. The name “Big Sur” is derived from the original Spanish-language “el sur grande”, meaning “the big south”, or from “el país emulate grande del sur”, “the big country of the south”. The Big Sur’s Cone Peak is the highest coastal mountain in the contiguous 48 states, ascending nearly a mile (5,155 feet/1571 m) above sea level, only three miles (4.8 km) from the ocean. The construction of Highway One in the 1930s transformed Big Sur, making its beauty accessible to all rather than just the most intrepid. Residents fought to protect Big Sur against development, preserving its charms and its remote feel. Become familiar with Big Sur’s history by visiting Andrew Molera State Park, home to Big Sur’s oldest building, and that famous Point Sur Lighthouse. Big Sur has provided inspiration to photographers, painters, writers and musicians. Henry Miller and Jack Kerouac chronicled the area in books, and Ansel Adams and Edward Weston captured Big Sur’s rugged beauty on film. Robinson Jeffers described Big Sur in epic verse, which later became the inspiration for the Beach Boys’ album Holland. Today Big Sur remains a favorite place for local and international artists of every stripe. Galleries located along Highway 1 exhibit stunning visual art, while venues such as the Henry Miller Library and Fernwood Resort host both cutting-edge acts and big names. The people of Big Sur today are a diverse mix: descendants of the original settler and rancher families, artists and other creative types, along with wealthy home-owners from the worlds of entertainment and commerce. Big Sur homes real estate costs are as high as the views, with most homes priced above $2 million. There are no urban areas, although three small clusters of gas stations, restaurants, and motels are often marked on maps as “towns”: Big Sur, in the Big Sur River valley, Lucia, near Limekiln State park, and Gorda, on the southern coast. Three million tourist visit the area each year therefore it is not surprising the economy is almost completely based on tourism. Much of the land along the coast is privately owned or has been donated to the state park system, while the vast Los Padres National Forest and Fort Hunter Liggett Military Reservation encompass most of the inland areas. The mountainous terrain, environmentally conscious residents, and lack of property available for development have kept Big Sur almost unspoiled, and it retains an isolated, frontier mystique. There are fewer than 300 hotel rooms on the entire 90 mile stretch of Highway 1 between San Simeon and Carmel, only three gas stations, and no chain hotels, supermarkets, or fast-food outlets. The lodging options are rustic cabins, motels, campgrounds, and luxurious five-star resorts. Most lodging and restaurants are clustered in the Big Sur River valley, where Highway 1 leaves the coast for a few miles and winds into a redwood forest, protected from the chill ocean breezes and summer fog. 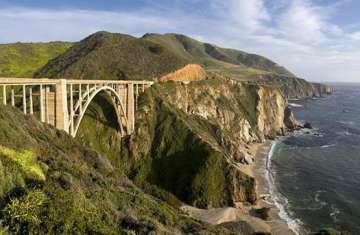 Besides sightseeing from the highway, Big Sur offers hiking, mountain climbing, and other outdoor activities. There are a few small, scenic beaches that are popular for walking, but usually unsuitable for swimming because of unpredictable currents and frigid temperatures. Big Sur’s nine state parks have many points of interest, including one of the few waterfalls on the Pacific Coast that plunges directly into the ocean, located at Julia Pfeiffer Burns State Park. Another notable landmark is the only complete nineteenth century lighthouse complex open to the public in California, set on a lonely, windswept hill that looks like an island in the fog. The nine state parks from a north to south drive along Highway Route State 1 are as follows; Carmel River State Park, Point Lobos State Reserve, Garrapata State Park, Point Sur Light Station State Historic Park, Andrew Molera State Park, Pfeiffer Big Sur State Park, Julia Pfeiffer Burns State Park, John Little State Reserve, and Limekiln State Park. The local federal park is Ventana Wilderness. 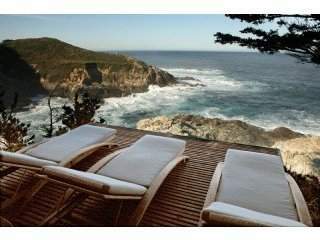 Perched on the edge of the celebrated Big Sur coast line rest some of the finest properties in the world. These luxurious estates celebrate the joining of land and sea in an understated elegance taking advantage of the panoramic ocean views. Big Sur homes offer front row seats to breathtaking sunsets, wildlife, nature, and an abundance of sea life at play. As you enjoy your views from this edge of the world you will revitalize your soul and calm your spirit. Many locals who land in Big Sur thrive in an outdoor living environment enjoying the collide of man, nature and sea. Big Sur homes afford exclusivity, privacy, expansive terrain and no neighbor’s for miles. If you desire any of these characteristics in your upcoming home purchase then Big Sur is the place for you! Allow real estate broker Nicole Truszkowski the opportunity to help you discover the vast neighborhood of the Big Sur Coast and all the unique characteristics of Big Sur homes for sale.